There was may of us that got exited when Ian Fleming Publications announced that they had hired author Anthony Horowitz to write a second James Bond novel after his success with his first novel titled Trigger Mortis. In the press release on the matter it was said that Horowitz second book will be released in the spring of 2018. I and many with me thought that the book would be released on Ian Flemings birthday on May 28th. 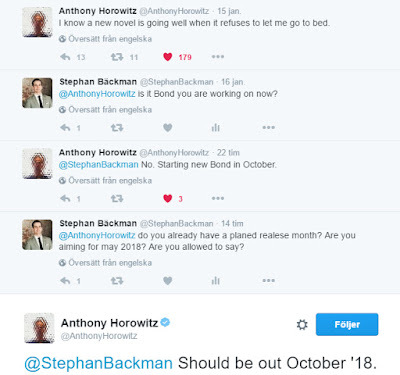 But today Anthony Horowitz told James Bond - The secret agent blog that he will not start working on the book until October 2017 and the book is sett to be released according to him in October 2018. The date change has not yet been updated on the Ian Fleming Publications site. But as you can see below. The information comes from the writer himself. 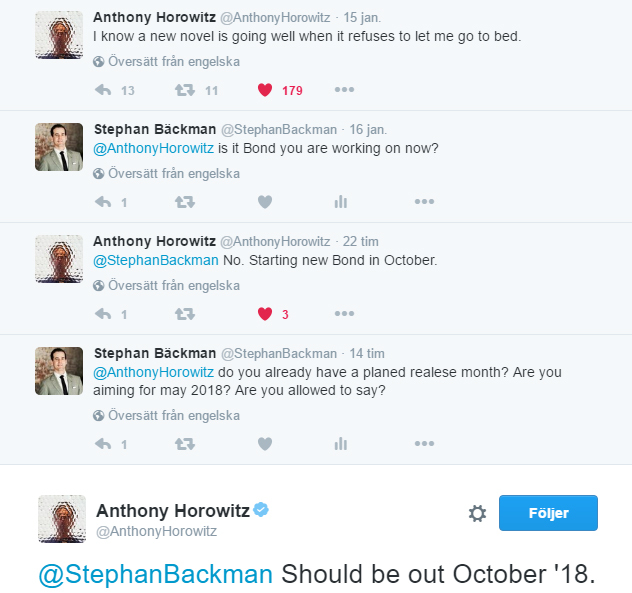 It will be truly fun to follow Anthony Horowitz journey when he writes his second James Bond novel. I just cant wait to read it. What a great birthday gift I got!